Japan’s Maritime Self-Defense Force will now respond when Chinese vessels enter the Senkakus’ territorial waters. On Tuesday, Japan’s Chief Cabinet Secretary Yoshihide Suga clarified that Japan’s Maritime Self-Defense Forces (MSDF) can engage in a “maritime policing operation” when a foreign warship enters Japan’s territorial waters and is not practicing “innocent passage” under international law. The Yomiuri Shimbun reported that such seaborne patrolling actions would be undertaken should Chinese naval ships enter the territorial waters surrounding the disputed Senkaku/Diaoyu Islands. Defense Minister Gen Nakatani also confirmed, “If it becomes difficult for the police and Japan Coast Guard (JCG) to deal with the matter [in the East China Sea], there is the principle of having the SDF respond through maritime policing activities.” Per the Self-Defense Law, the MSDF could operate when the JCG is not sufficient to deal with the situation – such as when a foreign ship outguns the JCG. The Abe Cabinet decided last May that the defense minister could mobilize the MSDF following a phone conference should such a contingency arise. Such a policing operation would be conducted under domestic law, and hence is not an act of war. Nonetheless, it still heightens the risk of military-on-military conflict compared to a mobilization limited to the JCG. Since a “policing activity” is a not a “defense operation,” there are limitations on use of weapons. But the MSDF can take other measures to demand the intruding ships leave, such as firing warning shots. Furthermore, weapons may be used when needed, i.e. for justifiable defense. Japan has conducted seaborne patrolling actions three times in the past: against North Korean spy ships (1999), against a Chinese nuclear powered submarine (2004), and during antipiracy missions in waters off of Somalia (2009). In 1999, Japanese warships fired warning shots and military aircraft dropped explosives against two suspected North Korean spy ships. This incident was the first time Japan had fired warning shots since 1953 – and it fired 1,200 in total. The chase continued for more than 24 hours until the ships made it to North Korean territorial waters. In 2004, Japanese reconnaissance aircraft and naval destroyers followed a Chinese submarine for two days after it was originally spotted between Okinawa and Taiwan and then traveled north. 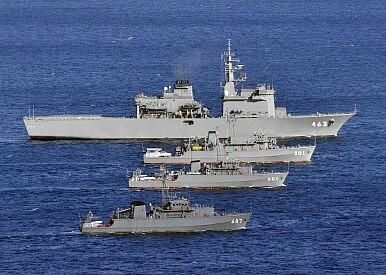 Japanese police actions off the coast of Somalia in 2009 were intended to protect Japanese-owned ships and ships carrying Japanese goods or crew. “Innocent passage” under the United Nations Convention on the Law of the Sea allows passage through territorial waters so long as it is not “prejudicial to the peace, good order or security” of the other state. Navigation for the purpose of using force, gathering information, and conducting propaganda activities does not fall under “innocent passage.” According to Yomiuri, the Japanese government will not grant the right of innocent passage to Chinese naval vessels traveling within Senkaku/Diaoyu’s territorial waters. Japanese sources also believe it is unlikely that China would even request innocent passage, because doing so would imply that China implicitly recognizes Japanese sovereignty. According to sources who spoke to Yomiuri, Beijing has been notified of this Japanese policy following activities by Chinese ships near the disputed islands last November. The defense ministry reported at the time that a Chinese navy intelligence ship engaged in information-gathering activities close to the Senkaku/Diaoyus, though the ship did not actually enter territorial waters at that time. The Chinese ship spent a day going back and forth between the Senkaku/Diaoyu Islands and Sakishima Island. This clarification of policy should be seen as a Japanese attempt to maintain the status quo in the East China Sea. The best-case outcome for Japan would be for China to believe Japanese policymakers when they say they have the capability and intention to police their territorial waters. If Japanese claims are seen as credible and China fears escalation should the MSDF get involved, deterrence would have succeeded. However, these recent announcements do not necessarily portend a radical change in behavior by either side. On the Japanese side, the procedural change (approval by a phone conference) happened back in May, and the policy’s application to the East China Sea was decided on and communicated to China in November. But China has continued maritime incursions into territorial waters – most recently a Chinese Coast Guard ship in late December, which entered Japanese territorial waters around Kuba Island. Though the two countries have worked hard to improve relations over the past year, the dispute over the Senkaku/Diaoyus continues to be a sticking point. In order to prevent unintended escalation, the conclusion of bilateral maritime liaison mechanism is of the utmost importance. While Japanese leaders want to defend Japan’s sovereignty over the East China Sea, they will only decrease their country’s own security if they make it easier for a miscalculation to happen. To complement this policy, Japan must work harder than ever with China to complete the mechanisms needed to ensure that professionalism on the waves will allow cooler heads to prevail on land.